Symbols that simplify the writing of the elements, formulas and chemical reactions. A chemical reaction corresponds to the conversion of reactants in products and is obtained by the loss of one of the reactants. The arrow indicates the direction in which this irreversible reaction occurs. 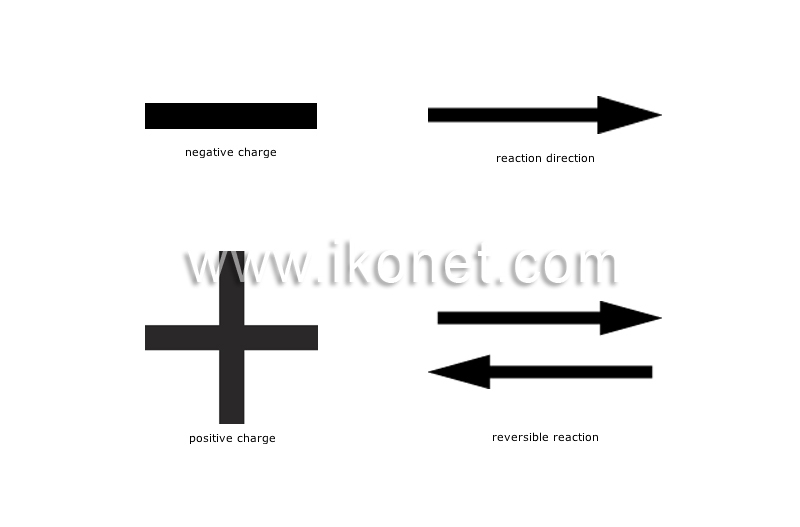 Chemical reaction that can occur in both directions; the products obtained (direct reaction) react between them to change back into the original reactants (inverse reaction). Symbol that indicates a loss of electrons in an atom, which means the atom has a positive electric charge. The sodium atom, for example, forms a positive ion that is denoted as Na+. Symbol that indicates a surplus of electrons in an atom, which means the atom has a negative electric charge. The chlorine atom, for example, forms a negative ion that is denoted as Cl-.